Question of Paramananda: A question about chanting. Once during initiation Shrila Shridhara Maharaja said that chanting without counting on a rosary means lack of service to Radhika. No service. Would you like to explain what does it mean and why is it like this? Swami Tirtha: Oh, that’s too high. This is complicated, I don’t know. Shrila Shridhara Maharaja is too divine. I am happy if I can receive some morsels from his chapatti, not to take part in the feast. But you asked about chanting and I was very happy about this topic. Because what is chanting? At the first time a neophyte devotee might think: ‘Oh, I am chanting the holy names. And I can use the maha-mantra for my purification.’ Or ‘I can use, take advantage from the maha-mantra to achieve my spiritual goals.’ Which is a grave misuse. If there is anything that is higher than ourselves we should not use it, we should serve it, appreciate it. So, later on you will understand that: ‘Well, I cannot use the maha-mantra. There is only one reason why I can chant this mantra and it is to glorify God.’ That’s a better conception, but still not the end of the story, because later on we shall understand that chanting is like glorifying the unity between Radha and Krishna. So, chanting this maha-mantra is not a simple function of the mantras in general. This is like an introduction into a very special and high type of spiritual mysticism. Although this is an open mantra, it’s a public mantra. But the ultimate version is when the mantra wants to be chanted. From that very beginner stage that ‘I chant the mantra’ we should come to the other side that the mantra wants to be chanted. The maha-mantra needs persons who glorify it. So beautiful that there is an invitation from above! It’s not that you use or misuse a spiritual chance, but somehow you are invited and engaged in a very delicate and very high type of service. And the maha-mantra is a very simple mantra – only three words. So, these are not the eighteen thousand verses of the Shrimad Bhagavatam. Only three words: Hare, Krishna, Rama. If we ask what the most often repeated word by the vaishnavas is, some devotees might think: ‘Oh, Krishna’. But it’s a mistake, it’s not Krishna. Hare! Hare is much more times mentioned in the mantra than either this Krishna or that Rama. From this you can see who is this more important in this mantra. Who is stressed more, more, more. At the same time this mantra is actually the essential compendium of our philosophy. Why? What is the top platform, the supreme conception in our philosophy? Swami Tirtha: Mahaprabhu would say: “Go further!” It’s not radha-dasyam, not the service of Shrimati Radharani. What is the feeling of Shrimati Radharani? Separation! The general religion simply means: ‘I want to come closer to God! I want to be in the company of God! I am searching for Him.’ That’s good. But the upgrade of that spiritual search, when the feelings are much more intensive, is when you are separated from Him. When you are with somebody, you take it very easy. Familiarity breeds contempt. But if somebody is missing, then you feel the need. But then how is separation contained in this mantra? How this hidden way is contained in this mantra? It’s very easy – Radharani is not mentioned directly there. In other main mantras of other sampradayas for example there is this Radhe-Shyam mantra: Radhe Krishna Radhe Krishna Krishna Krishna Radhe Radhe. 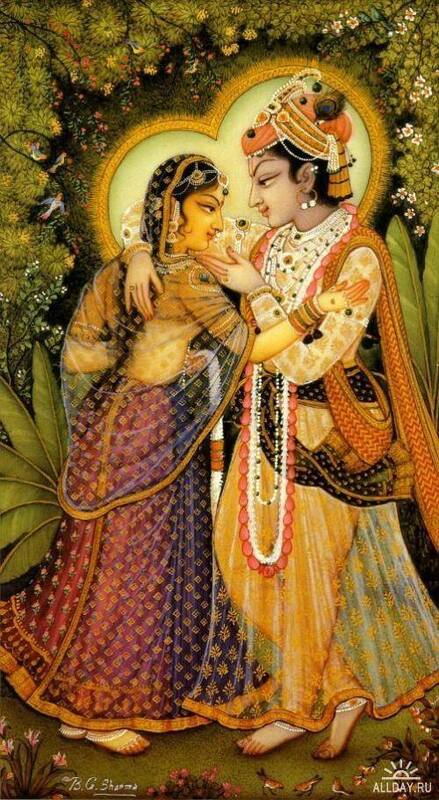 Radhe Shyam Radh Shyam Shyam Shyam Radhe Radhe. Radhe-Krishna-Shyam. Here – Hare-Krishna-Rama. So, Radharani in our maha-mantra is hidden, not directly mentioned. That is a very high conception. This is not the direct mention of our beloved, but indirect mention – svakiya and parakiya. Radhe Krishna Radhe Shyam – this is svakiya, official. Hare Krishna is beyond these limitations. So, this is an open mantra, non-secret. Yet, this is highly secret, top secret! And our acharyas give their understanding of the maha-mantra. Some I am ready to repeat here, some I am not ready to repeat. Question of Kripadham: Gurudev, you mentioned that in chanting there are a few stages. I am interested in the second part in connection with worship. What can be done by a person who realizes that he has to worship, but he cannot. The theoretical understanding is there, he knows that this should be done, but he cannot do it in a proper manner within. And his chanting turns to offence. So, I think it’s very similar with any type of service, including chanting. Even if we don’t feel the high ecstasy that is described by the acaryas, we should perform it – trying to avoid the mistakes, trying to improve the quality of our chanting. Because this is the way to come to deeper realizations. Don’t worry, Krishna listens to your prayers! The divine sound is a direct link, local call.